Sundots are daily gummies that provides full-body sun protection. In recent years, cumulative sun exposure has been pinpointed as the leading cause of skin cancer and responsible for 90% of preventable skin aging. Photoaging of skin results in the premature development of rhytides (wrinkles), laxity (sagging skin), uneven skin tone and rough skin texture. Sundots harnesses the power of Polypodium leucotomos, a fern backed by years of extensive research that’s proven to enhance the skin’s natural ability to fight sunburn and skin aging. Today, Sundots launched on Indiegogo with a funding goal of $20,000. Polypodium leucotomos, a fern native to Central and South America and sourced from Ecuador, is the all-natural, active ingredient in Sundots. Researched for more than 30 years, over a dozen clinical studies have shown that when taken as an oral supplement, the fern provides ample protection from sun damage. Studies consistently conclude that this natural plant extract has the potential to complement sunscreens and other methods of photoprotection by providing sun protection from within. Additionally, polypodium leucotomos has been shown to be safe with no serious adverse reactions reported in its 30-year research history. Sun protection is not only necessary at the swimming pool or on the beach, but in all outdoor and indoor settings. Because 80% of UV rays still penetrate through clouds, it’s absolutely vital to to be protected year-round. Taking Sundots on a daily basis helps add an additional layer of protection. As a company, the team of experts behind Sundots is impassioned about highlighting sun protection and safety. When used in conjunction with UPF-rated clothing and SPF 30+ sunscreen, these bite-sized gummies efficiently shield the skin and body. Sundots are vegan, made with organic ingredients, and non-GMO. They are made in an FDA-registered pharmaceutical grade manufacturing facility in the United States. 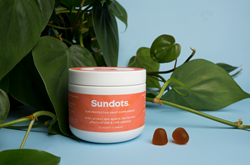 On their Indiegogo campaign page, the Sundots team is offering perks that allow consumers to purchase Sundots in a one, three, six or 12-month supply starting at an “Early Bird” price of $33. Targeting delivery for the summer season by July 4, Sundots are the ideal solution against harmful sun rays, year-round. To learn more, visit the campaign at bit.ly/SundotsIGG.